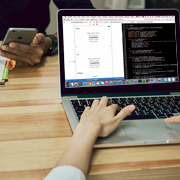 Developing leaner and faster apps without forfeiting functionalities is easier, thanks to Swift - multi-paradigm programming language from the Apple Inc. The succinctness of syntax and coding rules make Swift a fast coding language for making your apps work smarter. But are you leveraging this language to the fullest to compress codes and cost involved in developing a dynamic back-end? If not, turn to swift app development from a company like ours. At Outsource2india, we understand how interoperability and robustness of Swift can lead to faster deployment of powerful and contextual applications on the Cloud. Swift is the next level of enterprise app development because it requires fewer codes to develop high-performance apps. If you feel Swift's interoperability is the key to developing feature-rich iOS & Linux apps, we are the people you need. If you have an idea we can help you bring it to life. All you have to do is outsource Swift app development services to us. We perform competitive analysis to discover ideal features that would enhance the value and functionality of your app. We know the secret to create a well-rounded app that ticks all the right boxes for end users. Stability, flexibility, and reliability are the three pillars of Swift framework that we harness to increase user engagement and productivity of your app. Be it future-proofing or adding new features to your existing iOS or Linux apps, our Swift app development services will make your apps faster and smarter. Why Choose Swift App Development Services from O2I? A Hong Kong-based client approached us in order to develop a unique e-Learning app which could help millions of people learn new languages from real tutors sitting halfway across the globe in an enjoyable manner. Our skilled software developers at O2I developed an Arabic iPhone app that was not only user-friendly but also had a real-time flow of data. The migration from the website to the mobile app was quick and seamless. We have worked with Outsource2india on various projects and find that they provide quality service and expertise for our programming needs. It is rare to find a service provider with such professional consistency - they are a valued service provider to our business! Outsourc2india is a provider of Swift App development in India with many global facilities. We are an ISO certified company with 20 years of distinguished recognition in app development solutions. We have already catered our solution to many clients in local and international locations. Our pricing and quality Swift development services can help you take high-quality apps to more users worldwide. We have several global offices where we operate to serve the local audience. This way we can service your needs more efficiently. Contact us now for high-quality and cost-effective Swift App development services.